A31-year-old young man presented with history of low grade fever and heaviness in the chest for last 3 months. He was previously evaluated and found to have a distal CCF of right coronary artery with multiple exits into right ventricle, the largest exit being 8 10 mm, opening just below the tricuspid valve. There was already mild dilatation of proximal conduit artery at the time of surgery in 1996. The exits and the entry points of fistula were closed surgically under cardiopulmonary bypass without residual shunt at the age of 11 years. The case was followed-up annually for future aneurysmal dilatation of residual ectatic conduit artery. Previous blood cultures done elsewhere were negative for microorganisms. General clinical and cardiovascular system examinations were normal. The chest X-ray in lateral projection showed complete filling of retrosternal space with a non-homogeneous opacity. Twelve-lead electrocardiogram was consistent and showed Q waves in the inferior leads. 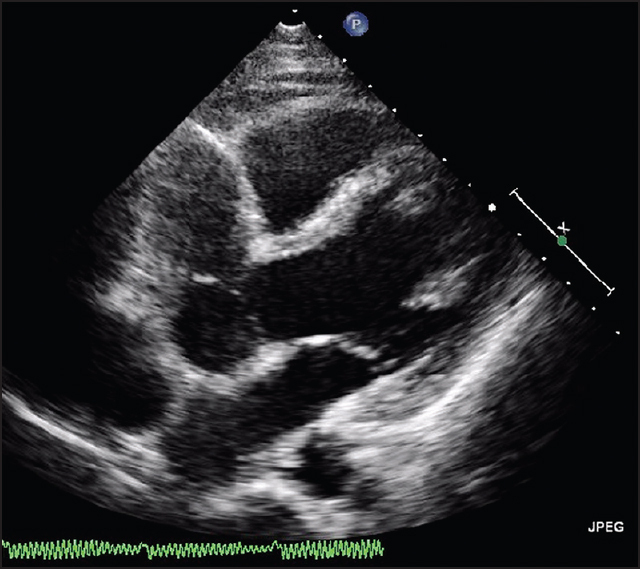 Two-dimensional echocardiography confirmed the diagnosis of giant right coronary artery aneurysm with anterior extension of distal end. There was no residual shunt and the distal end was filled up with organized thrombus [Figure 1] and [Figure 2]. There was no regional wall motion abnormality in the inferior wall. The total leukocyte count and neutrophil count were high with a shift to left; blood cultures were negative. The fever responded well to empirical antibiotics (ampicillin and gentamicin) given for 2weeks, given for possible endarteritis. Sixty-four slice multidimensional computed tomography (CT) with contrast enhancement of aortic root and coronary arteries showed dominant right coronary artery, giant right coronary artery aneurysm including the adjacent of right sinus of Valsalva (RSOV) of size 3.5 2.8 cm at the ostium and 5.6 6.3 cm distally filled with thrombus. The distal half of cull-de-sac had patchy calcification. Posterior descending artery and post left ventricular branch were filling by Rentrop's grade III contralateral collaterals [Figure 3]. 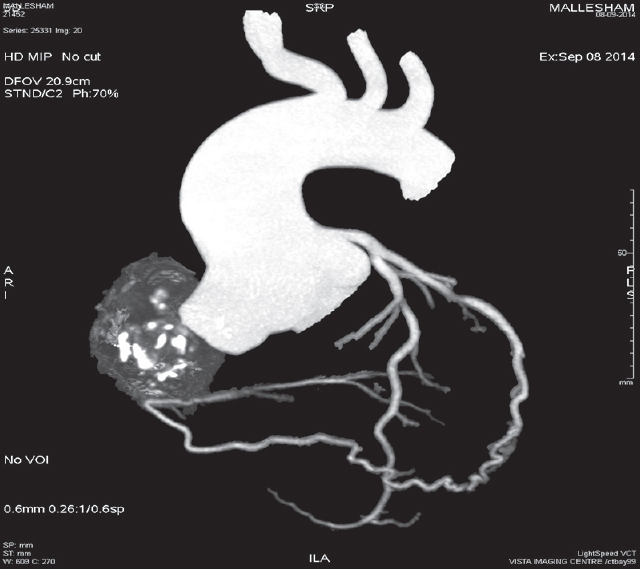 The aneurysm was excluded from right coronary sinus, using Dacron patch of size 3 cm × 2 cm. The compressed and eroded right atrial wall was repaired by using bovine pericardial patch. The distal right coronary was grafted using saphenous venous graft. The procedure under cardiopulmonary bypass was uneventful as was the postoperative recovery. The biopsy specimen of aneurysmal sac was consistent with evidence of chronic nonspecific endarteritis. This case can be considered as a "stem from trunk". If the trunk of a tree is nourished well, even after cutting all the branches, new branches can arise from the trunk. Therefore long-term follow-up is essential irrespective of closure techniques used for CCF when residual conduit artery is associated with ectasia. Inoue H, Ueno M, Yamamoto H, Matsumoto K, Tao K, Sakata R. Surgical treatment of coronary artery aneurysm with coronary artery fistula. Ann Thorac Cardiovasc Surg 2009;15:198-202. Trehan V, Yusuf J, Mukhopadhyay S, Rangasetty UC, Mehta V, Gupta MD, et al. Transcatheter closure of coronary artery fistulas. Indian Heart J 2004;56:132-9. Gowda ST, Forbes TJ, Singh H, Kovach JA, Prieto L, Latson LA, et al. Remodelling and thrombosis following closure of coronary artery fistula with review of management: Large distal coronary artery fistula - to close or not to close? Catheter Cardiovasc Interv 2013;82:132-42. Wang S, Wu Q, Hu S, Xu J, Sun L, Song Y, et al. Surgical treatment of 52 patients with congenital coronary artery fistulas. Chin Med J (Engl) 2001;114:752-5. Sunder KR, Balakrishnan KG, Tharakan JA, Titus T, Pillai VR, Francis B, et al. Coronary artery fistula in children and adults: A review of 25 cases with long-term observations. Int J Cardiol 1997;58:47-53. Valente AM, Lock JE, Gauvreau K, Rodriguez-Huertas E, Joyce C, Armsby L, et al. Predictors of long-term adverse outcomes in patients with congenital coronary artery fistulae. Circ Cardiovasc Interv 2010;3:134-9. Wang NK, Hsieh LY, Shen CT, Lin YM. Coronary arteriovenous fistula in pediatric patients: A 17-year institutional experience. J Formos Med Assoc 2002; 101:177-82. Wang SS, Zhang ZW, Qian MY, Zhuang J, Zeng GH. Transcatheter closure of coronary arterial fistula in children and adolescents. Pediatr Int 2014;56:173-9. Kitano N, Suzuki H, Takeuchi T, Suenaga T, Kakimoto N, Shibuta S, et al. Wakayama Kawasaki Disease Study Group. Epidemiologic features and prognostic factors of coronary artery lesions associated with Kawasaki disease based on a 13-year cohort of consecutive cases identified by complete enumeration surveys in Wakayama, Japan. J Epidemiol 2014;24:427-34. Michelson AD, Bovill E, Andrew M. Antithrombotic therapy in children. Chest 1995;108:506-22S. Gowda ST, Latson LA, Kutty S, Prieto LR. Intermediate to long-term outcome following congenital coronary artery fistulae closure with focus on thrombus formation. Am J Cardiol 2011;107:302-8. Papadopoulos DP, Ekonomou CK, Margos P, Moyssakis I, Anagnostopoulou S, Benos I, et al. 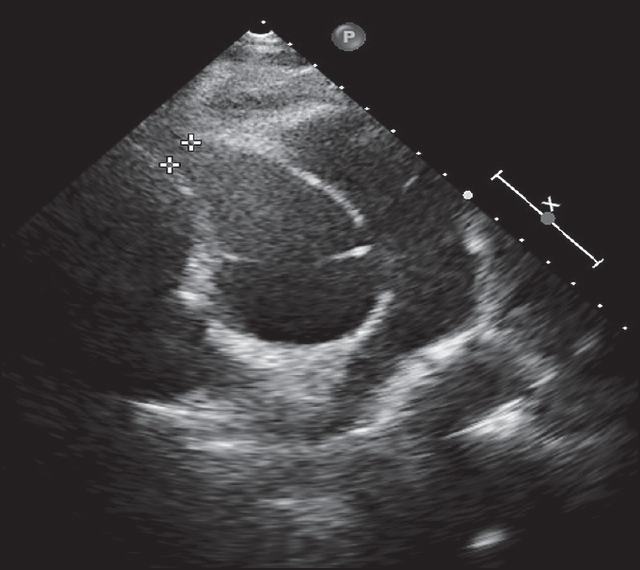 Coronary artery aneurysms and coronary artery fistula as a cause of angina pectoris. Clin Anat 2005;18:77-8. Kacmaz F, Isiksalan Ozbulbul N, Alyan O, Maden O, Demir AD, Atak R, et al. Imaging of coronary artery fistulas by multidetector computed tomography: Is multidetector computed tomography sensitive? Clin Cardiol 2008;31:41-7.